I’ve spent the last few days hobbling around town on blistered feet. I don’t recall having done anything to merit blisters so it seemed odd to have so many that were sprouting up like warts all over my feet. One of many blisters on my feet. Poor picture is a reflection of the odd placement on my foot and my general lack of flexibility. Finally, I could bear as I could bears no more and I took out my swiss army knife to lance them and relieve the pressure. Well, no sooner do I stick my blade into my blistered foot than a tiny, wriggling, maggot oozes out. Upon lancing the blister, the female Chigger with eggs was released. Poor picture is a reflection of the odd placement on my foot and my general lack of flexibility. Chigger (Tunga penetrans) taken at 5x magnification. The legs have fallen off, since they are no longer needed in its “habitat for humanity”. It is resting atop my swiss army blade which I used to pry it out. There were many opportunities in this and the following days to get shots of these insects. “Oh, that was the problem”, I say to myself, not really disconcerted in the least. Now I am a veteran at things crawling into my body and laying eggs, sucking my blood or just chilling out in those warm damp places. A note to the lady readers in the audience, Yes I am still single (God am I ever single), very much available and as far as I know, parasite free (don’t quote me on that last part). A sidenote: When I was in Peru last time with my sister, I was absolutely ravaged by mosquitos in Manu national park. I counted over 500, and this was after applying 100% DEET, wearing long sleeved shirts and tucking myself into a permethrin coated mosquito net at night. Well one mosquito bite in particular was giving me particular trouble as the swelling refused to go down despite not scratching it. The bump was right on my left temple in a pretty prominent location. 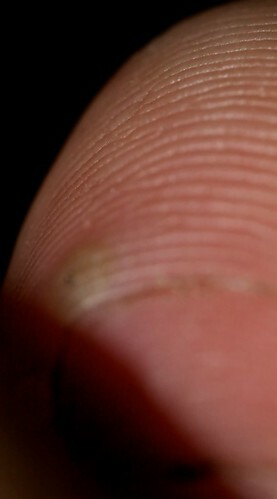 In fact at times it was quite painful, it felt like I was being jabbed repeatedly by a needle. I told my sister I think I have a botfly infection. I distinctly recall having told her this before we saw a presentation from our guide on tropical infections in which the botfly figured prominently. Another guy in the group, who I think of as a bit of a hypochondriac thinks that he has a botfly infection too and gets his wife to check him over. But my case is completely different…My sister entertains my suspicions with skepticism but agrees that if I am really worried I should go to the hospital. Interestingly I’m the one who has to push to go to the hospital despite her being the one that often says that I don’t take care of my own health (Ahem). So we take a taxi to go to the hospital (Enough with the taxis already!!!!) where after waiting a while and paying a nominal fee, they tell us we will see an American doctor. My spanish is quite rusty so I’m quite happy at this development. Things are looking up (Oh come on, you know by now that I’m just leading you on with that statement that it’s really the complete opposite). When we’re introduced to the “American”, apparently it’s some Spanish doctor whom they call the American for some reason that no one quite knows (Go figure). Not only that, but he doesn’t meet us in any kind of a regular office, but in some random room filled floor to ceiling with files. My intuition allows me to deduce that it is perhaps a file room. These developments lead us to believe that not only is he not American, but he looks more like a janitor who stole a white robe. After poking and prodding the bump on my noggin’, shining a light on it, squeezing, etc…he concludes that I don’t have myasis (the technical term for a botfly infection). My sister claims that I probably got an infection scratching my mosquito bites with my dirty finger nails. “There not that…well I suppose it’s not THAT far fetched a hypothesis”. But I am as resilient in holding onto my beliefs as I’m sure that botfly is resilient to the wiles and charms of the Doctor/Janitor who attempted to coax it out. So I spend the rest of my vacation worrying about this non-subsiding lump in my head. It gradually starts oozing blood and a brownish liquid. Finally, when should things decide to come to a head? I’m at Canadian immigration and the officer asks me, “Do you have anything to declare?” At this time who should choose to make his appearance, but the little maggot. Honestly, this time of all times he pokes his head out, takes a look around and goes back into his hole, he’s made his brief cameo back to the burrow. The customs officer looks decidedly ill and contemplates a moment whether to wave me through or detain me. He wavers but finally allows me to pass. I head straight fort the bathroom to take a look at the sucker, where I see him playing hide and seek in my head. He’s coy, playful even, I ascribe a personality to him. I feel like I’ve given birth to some kind of a child monstrosity. The next few days he comes out every once and a while to see the comings and goings of the people around, loses interest and retreats back into my head. But the day finally comes for the extraction. It is simply getting too painful as he is growing larger. So with the assisstance of my mother we smother the breathing hole with vaseline. As he comes up to breathe I squeeze both sides of the swollen lump, immobilizing him. He struggles, trying to work his way back down. I can feel the panic! “Sorry little guy, this is the way it has to be”. My mother tries to get a hold but the tweezers slip. He uses his last remaining moments of freedom to try and wriggle free. “I can’t hold him much longer”, I strain. My mother is trying to get a firm hold but the slippery head weaves and bobs. Thousands of years of evolution have trained him for this moment (Man he’d be good on a dodgeball team I briefly think to myself). “Got him”, my mother squeals victoriously! She slowly begins pulling him out, careful not to break apart the soft, pliable tissue. I groan as she pulls as the breathing hole which is no more than a pinprick widens to the size of a large pea to accommodate the bulky frame of the larva. The size surprises both of us. Finally, in a shower of blood and brownish waste flushed from my head the larva is pulled free.”May you rest in peace”, I say with bowed head as I drop him into a bottle of alcohol and put him in my closet so that he may always serve as a reminder of those good times we shared. A hitchhiker followed me home from my recent trip to the Peruvian Amazon. 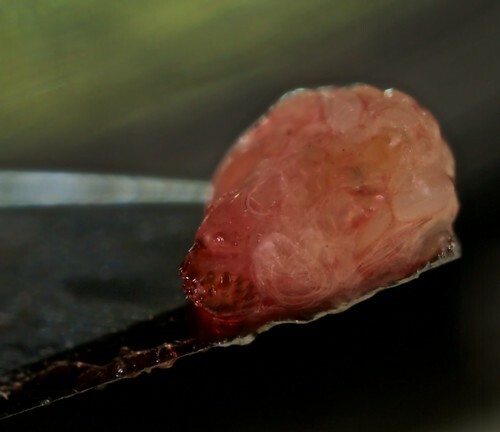 A human botfly larva (Dermatobia hominis). Relatively well developed after spending 2 months in my head. A recently extracted human botfly larva. The rows of hooks help keep the larva firmly entrenched under the skin. The strategy is basically the same as seen in the video in this thread:http://www.diptera.info/forum/viewthread.php?forum_id=21&thread_id=26344. Only instead of a housefly, it is a mosquito which is caught and which acts as the vector. ——————————————————————————————————– “Well, one down”, I say “only…” and I spend the next five minutes counting all the little pustules on my feet. So now we know how I spent the weekend. This hardly seemed like fair reward after the hardships that I had been through, but you’ll notice a recurring pattern where me and my good friend lady luck is concerned. I look online to try and figure out what these blisters are and then I recall a conversation that I had had with Trisha and Willow at Mendie’s landing. Trisha was helping Willow pull something out of his foot. “Paul, you ever seen a jigger before?’. “It’s pronounce chigger”, I tell them and “yes I have seen them, they don’t actually burrow into the skin as is the common misconception, rather they bite you and cause an itchy rash, they are a kind of mite/tick”. They nod and go back to the extraction process, and I go back to reading War and Peace, smug in my scientific knowledge. Now I look at myself, the tarot cards would call me the leper…a man to be shunned. “Not so smug anymore now are you”, I can imagine Trisha and Willow looking down on me. I look it up online and see that yes, in fact they are both jiggers and chiggers. 1) Why do there have to be so many damn human parasites and 2) Why do they all gravitate towards me? So the female jigger, chigger or sand flea (Tunga penetrans) requires a warm safe environment in which to store up energy, get healthy and then lay eggs. What better place than under mammalian skin. So the female larvae are present in the sandy soils of the tropics and await the vibrations indicating traffic. Whereupon they lodge onto the animal passing by and burrow under the skin where they develop. They shed their legs which are no longer of any use in their new environment and begin producing eggs. It is said that in regions where they are endemic 100% of the population contracts jiggers when walking around barefoot. So these insects really are very good at what they do. A lesson to always wear sandals and to put down a towel when lying in the sand. I’m just glad I didn’t get them anywhere besides my feet! I did accomplish a few errands though in preparation for my next trip: to the Kurupukari and Iwokrama. I bought gas for the stove, bus tickets and food supplies. Intraserv buses are up and running again, so I decided to catch the earliest bus, on tuesday and hopefully thereby avoid another minibus fiasco. The bus terminal is also only 1 block away from my hostel which is another big bonus. They say every time you catch a taxi, a devil gets its wings…well, I say that anyways, so I avoid them wherever possible and this proved quite providential. 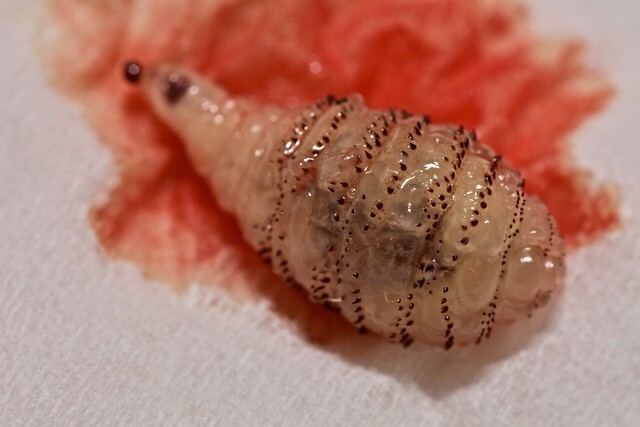 I hope you do not mind; I used your botfly larva photo to create a fan page on Facebook. I credited your URL in the photo. If you wish for it to be taken down, send me an email and I will do so immediately. If you do allow it though, thank you very much.